Note: Those who simply want to sign up to volunteer should go directly to the Volunteer Schedule page. 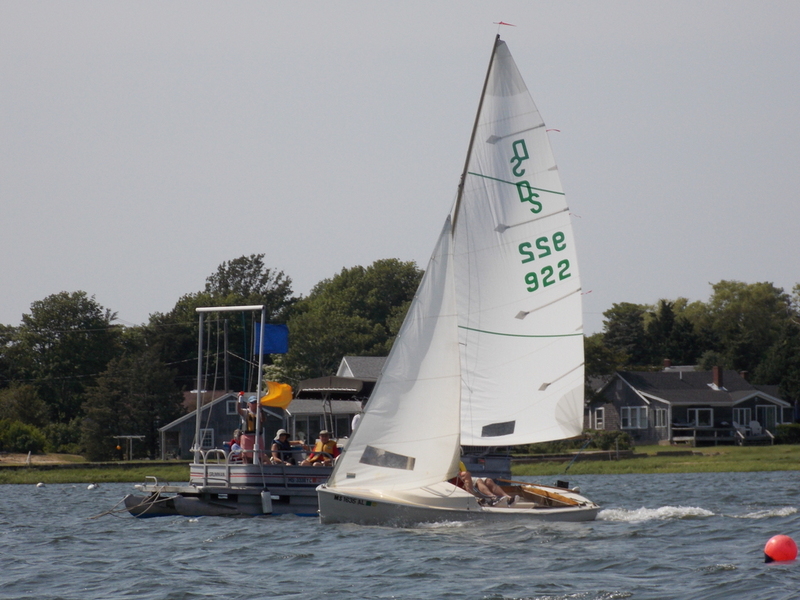 OYC provides the race committee boat and two safety boats used during the Fleet 15 races. The volunteers that man the committee boat and safety boats are mostly OYC members. Races are held on every Sunday from June to September. 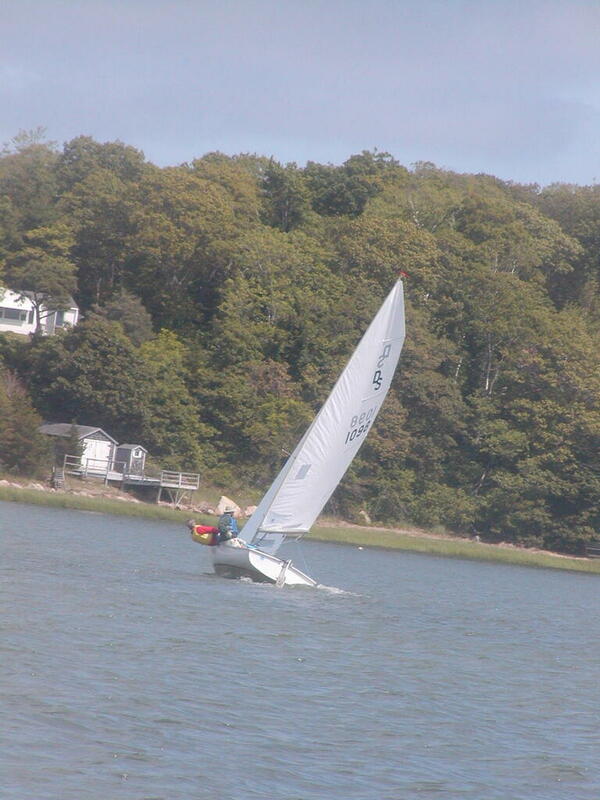 There is also a two day Sunfish regatta toward the end of September. Volunteers are asked to sign up for two or three Sundays of their choosing. 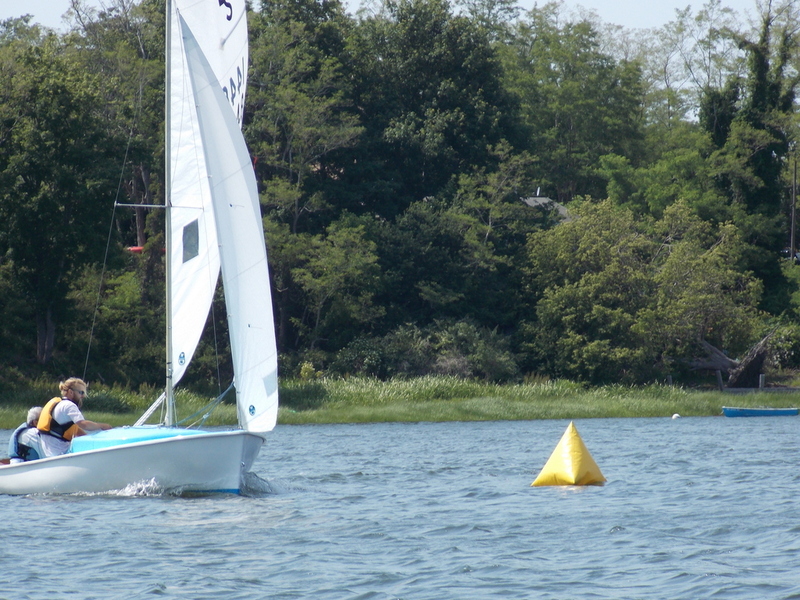 Experienced volunteers from OYC and Sherborn Yacht Club (SYC) are asked to help with the two day regatta. For the regular race season, no prior experience is needed to volunteer. At least four people are needed on the committee boat of which no more than two can be inexperienced. At least two people are needed on each safety boat of which no more than one can be inexperienced. 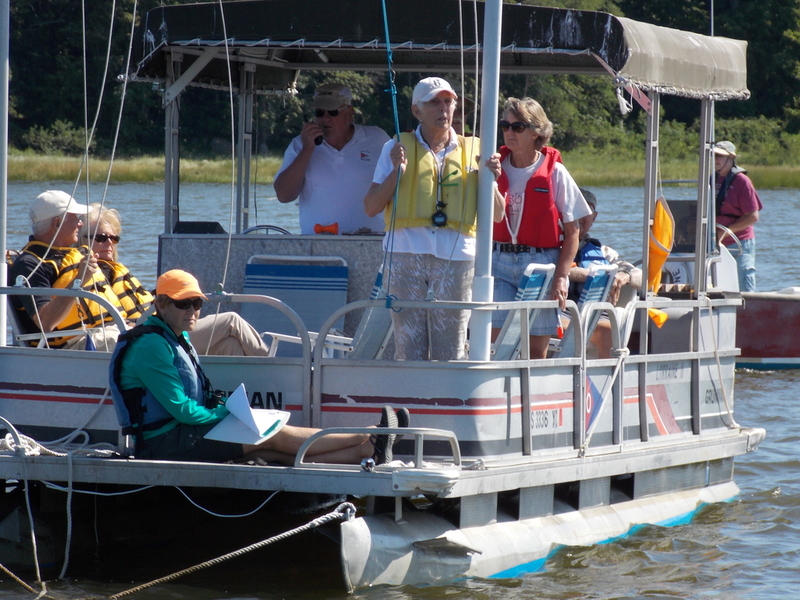 The OYC committee boat is large pontoon boat known as the "Loraine II" (sometimes abbreviated L2, such as on the ignition key). It is a very stable platform and relatively confortable with fixed seating and a few folding deck chairs on board. 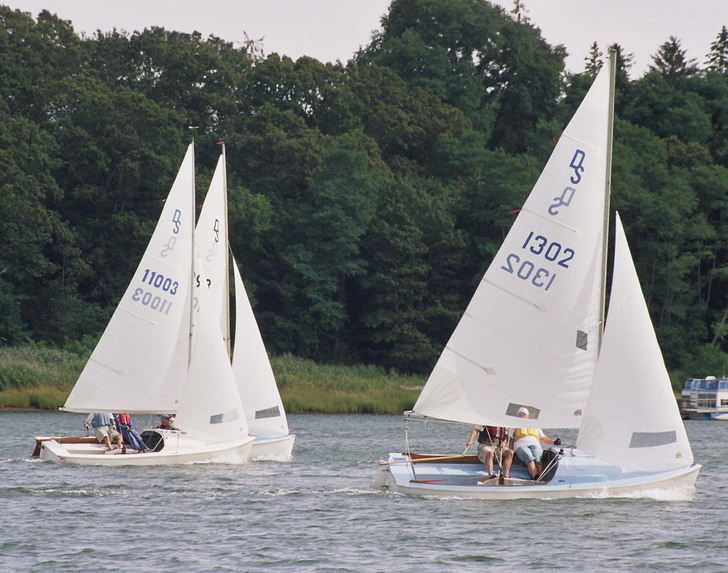 The race is coordinated by the Principal Race Officer (PRO), a person who is experienced in small boat racing, running small boat races, and is knowledgeable in the racing rules . At least one other experienced volunteer is needed on the committee boat. The PRO coordinated with the safety boats to set the race marks prior to racing, and moving race marks between races as needed. The committee boat volunteers are the busiest at the race starts and while boats are crossing the finish line. During the races, the committee boat volunteers keep an eye on the races, with the PRO and anyone very familiar with the rules keeping an eye out for potential rules violations. Race committee boat volunteers are instructed in the race starting procedure. A quick graphical summary of the race start can be found on the Quick References for Racers and Volunteers web page. Volunteers are also asked to call out the sail numbers of boats crossing the finish line. The busiest time for the committee boat is the race start. Inexperienced volunteers can easily serve in roles such as raising and lowering flags and sounding the horn and timekeeping at the race start. As experience is gained and with more familiarity with the race start, a volunteer can take on more critical roles such as time keeping and race results recording. Part of the volunteer training session is dedicated to review the procedures of the committee boat. This is helpful for both new and returning volunteers. Actually getting out on the water for the first time and participating in a few days of racing can quickly give a new volunteer the confidence to take on some of the more critical roles, such as recording race results. One of the two safety boat volunteers needs to be experienced in operating a small motor boat. The two safety boats are a 17 foot Maritime Skiff and a 17 foot Boston Whaler. These are large enough to be very stable. Both have a small swim platform and a boarding ladder at the stern should a racer need to be brought aboard. If one is out of commission, a 15 foot Boston Whaler is available. A volunteer's private motor boat may be used if suitably equiped. Under the instruction of the PRO (by radio and/or hand signals) the safety boat volunteers set the race marks before racing, moving them between races if needed due to wind shifts, and retrieving them after racing is done for the day. The marks are the yellow inflatable tetrahedrons used at each turning mark and the red sherical mark (known as "the pin") used as one end of the starting line. At each race start one or both safety boats may hold station beyond the pin in position to sight along the starting line and help the committee boat determine which boats, if any, were over the starting line prematurely. This should be done by an experienced volunteer. The safety boats are also responsible for assisting boats and crew as needed, from the time the sailboats leave the OYC dock to the time they safely return to the dock. Whether this involves any work at all depends on wind strength. 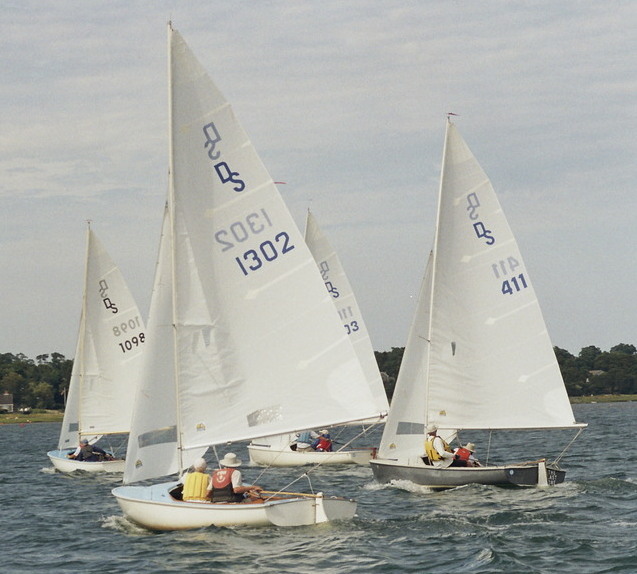 On days with light winds, the safety boats role during the races amounts to keeping an eye on the participating boats and staying out of the way. On days with stronger winds the safety boats may be called into action during a race. Racing is cancelled if under the judgement of the PRO there are any safety concerns. Individual racers are responsible for withdrawing if conditions exceed their abilities. Generally racing is cancelled when thunder is heard or expected, or if wind strengths are excessive or expected to become excessive (generally at 20 knots or 15 knots with gusty conditions). In the event that a boat capsizes, safety of the skipper and crew are the top priority. If all aboard are accounted for and in no danger, then the priority is keeping the mast from submerging and avoiding potentially rig damage from coming in contact with the bottom. Assistance may be needed in righting the boat. The skipper and crew are then responsible for bailing their boat. In some cases a boat may need to be towed to the dock. 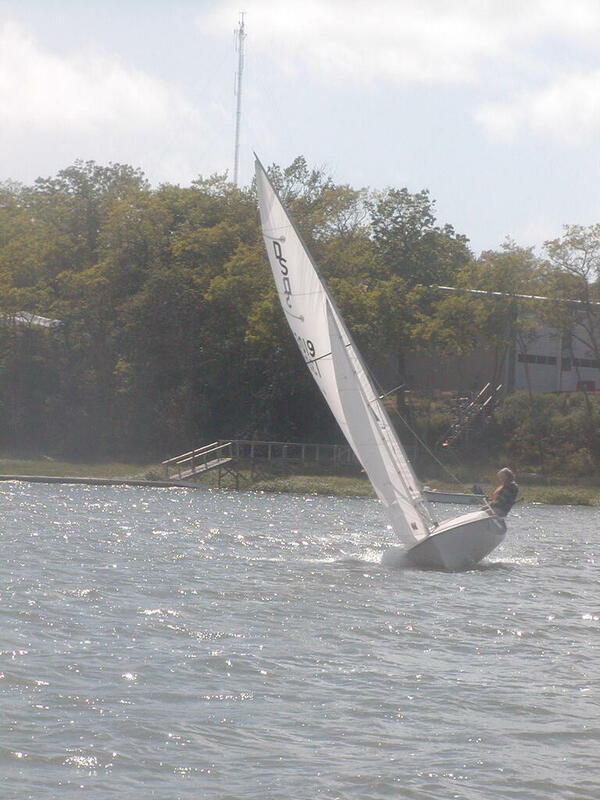 Providing assistance to a capsize may sound harder than it is. Having at least one experienced volunteer on board should make it go smoothly. This is also where the volunteer training can come in handy. A training session for new volunteers and review session for returning volunteers is held every year at the end of May, generally on the Sunday after Memorial Day at 6-8 PM. 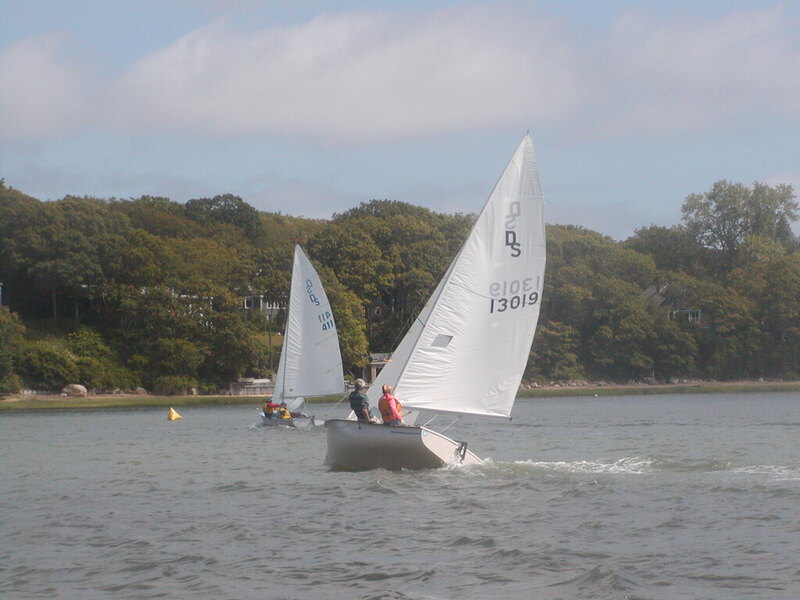 Since a number of volunteers are off Cape in late May, a later training session might be offerred in the future but would need to be mid-week in the evenings due to the busy OYC schedule during summer. The training sessions review both committee boat and safety boat procedures. The sessions are held in the OYC clubhouse. Some of the equipment used on the committee boat and the safety boats is brought inside. This allows the committe boat volunteers to become familiar with the placcards, flags, horn, stopwatches, and race results forms and race procedure notebook used during the races. This also allows safety boat volunteers to become familiar with the first aid kits, towing bridles, spare PFDs and other equipment on the safety boats. The boats themselves are within view of the OYC clubhouse and such things as the location of the safety boat swim platforms and boarding ladders can be pointed out. Other topics of interest to all volunteers are discussed, such as the proper use of marine VHF radios.